If you have any questions about the SEA STAR information page below please contact us. This motor yacht SEA STAR is a superyacht of ample proportions. This 45 metre (147 ft) luxury yacht was begun and finished at Lurssen Yachts in 1964. Superyacht SEA STAR is a sumptuous yacht that can accommodate as many as 10 people on board and has approximately 5 crew. The naval architecture office whom authored her drawings with respect to this ship was Lurssen and Ercument Kafali. Bebek was the designer which over saw the overall interior design. Motor yacht Sea Star was originally built in 1964 for the German Navy as a high speed Patrol vessel. She was used by the German Navy until about 1972 when she was gifted to the Turkish Navy who kept her in service until the mid 1980’s. The vessel Sea Star was then totally rebuilt and converted by Selah shipyard in 2007. With her deep V hull, she has both great speed and efficient fuel economy. SEA STAR offers large windows and light interior woodwork and carpets giving a nice open and spacious feel. 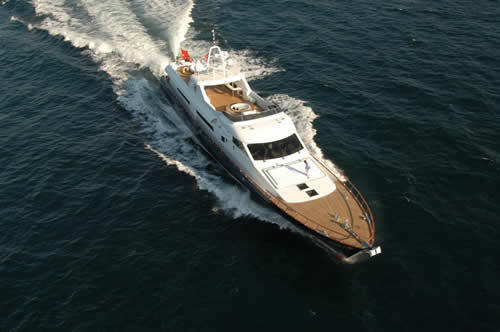 She has a spacious master, a VIP, plus three twin cabin for singles or children. Each VIP stateroom has it's own name and specific decor. The yacht's wider design collaboration came from Lurssen and Ercument Kafali. The formal naval architect firm intellectual property are a products of Lurssen. 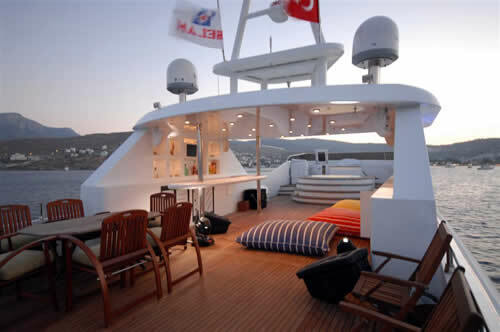 Motor Yacht SEA STAR received her stylish interior designing from the interior design office of Bebek. Germany is the country that Lurssen Yachts completed their new build motor yacht in. After her formal launch in 1964 in Bremen the boat was released to the happy owner following sea trials. A reasonable feeling is brought about with a widest beam (width) of 7.3 m or 24 ft. With a 2.05m (6.75ft) draught (maximum depth) she is shallow. The material wooden was used in the building of the hull of the motor yacht. Her superstructure above deck is built from mahogany. This ship makes use of two hearty MTU main engine(s) and can drive at a exhilarative top end speed at 22 knots. The main engine of the ship generates 1500 horse power (or 1119 kilowatts). Her total HP is 3000 HP and her total Kilowatts are 2238. Connected to her MTU engine(s) are twin screw propellers. The boat’s animated cruising speed is 17 knots which enables a range of 1500. 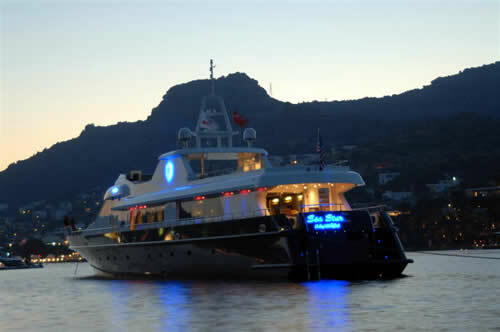 Apportioning cabins for a limit of 10 yacht guests spending the night, the SEA STAR accommodates everyone luxuriously. This ship requires approximately 5 professional crew to maintain and sail. The propulsion comes from two 1500 HP / 1119 kW MTU. The Model type is 16V 2000 M90 diesel. Approximate Cruise Speed is 17 knots. The luxury yacht SEA STAR displayed on this page is merely informational and she is not necessarily available for yacht charter or for sale, nor is she represented or marketed in anyway by CharterWorld. This web page and the superyacht information contained herein is not contractual. All yacht specifications and informations are displayed in good faith but CharterWorld does not warrant or assume any legal liability or responsibility for the current accuracy, completeness, validity, or usefulness of any superyacht information and/or images displayed. All boat information is subject to change without prior notice and may not be current.